Two weeks ago was my birthday. I drank two beers through a straw. They gave me a pretty good buzz. I hadn’t drank in a while. My kids and grandkids came up for the big day too. It was quite the celebration. Some of the staff at the home made me banner, one of the nurses baked me a cake. A hundred years is a long time to live. I think I’ve made the best of it. I have lived here five years. While hear, I’ve heard remarkable stories from remarkable people. I’ve been told long-winded tales about fighting Nazis, running businesses during the depression, and losing loved ones at a fraction of my age. My stories are simpler. I guess that’s because I lived a fairly simple life. Not that I’m complaining. My life has been filled with plenty of happy moments. I grew up in Minneapolis in a small house a few blocks away from the Mississippi River. I loved watching the boats motoring passed during the summer. It blew my mind that this strip of water stretched up and down the entire country. After I graduated from high school, a lot of my friends moved on to college. My family was much too poor to send me. I went to work. I worked at a printing press in St. Paul for a few months, but soon the boredom bug bit me hard. My body wasn’t meant to work in the city. I felt the river calling me north. In May of 1924, I decided to follow the calling. My uncle worked up north near Grand Rapids in a logging camp. I sent him letter after letter after letter asking if I could work with him. He denied me every time. It’s much too dangerous up her, my uncle’s letters would say. Your mother would kill me if I gave you a job. The Swam River Logging Company still don’t need any your time. But a very popular man up here named of Paul Jacobson could use you. The message was vague and incomplete. My uncle was very poor writer. The last line of the letter was the most important - Come up. Two days after I received the note, I packed my bags to travel north. Back then heading up north didn’t mean cramming your kids in the mini-van. No, not at all. There was a choice of taking a steam powered ferry, or a train to the great Minnesota wilderness. Unfortunately, there wasn’t a train going to my destination. I was headed to a small but bustling town—Mississippi Landing, Minnesota. Mississippi Landing was the main shipping point for the Swan River Logging Company. That’s the company my uncle worked for. All of the lumber harvested up there was sent floating down the mighty Mississippi. Lots of guys lost their lives trying to herd those trees downriver. The ferry I rode was called The Oriole. It was one of the last ferries of its kind. In fact, I think it was the last. When the ferries disappeared, northern Minnesota changed forever. 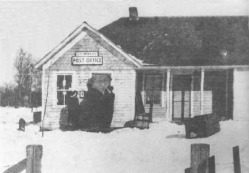 Back then Mississippi Landing had a bit of everything, but the post office was the heart of the town. My uncle and a man named Paul Jacobsen met me when I arrived at the village. My uncle told me that Paul was a very important man and I should respect him. I followed my uncle’s wishes. After all, it would be hard not to respect a man like Paul. Paul arrived at Mississippi Landing before it was a town. I’d heard from lots of folks that there would never have been a town without him. You see—back in 1901, before I was born, Paul opened up The Mississippi Landing Post Office on a vacant spot on the river bank. Slowly the post office became a place for the men of the north to socialize. Soon there were so many people socializing in the post office that Paul had to expand. First he built a general store. Next he opened a repair shop. Then a lumber mill. Before he knew it, he had created a full-blown village. I was small. I weighed no more than 120 pounds and was nothing but skin and bones. Paul, on the other hand, fit in perfectly with the trappers and woodsmen. He was a large man, with a snaggly black beard, and a booming voice. Everyone loved Paul. Soon after my arrival, Paul gave me the best job I‘ve ever had. I was put in charge of the post office. They called me the Postmaster. I loved that title. I was the most important person at the most important place in town. Lumberjacks would come in and tell me stories. I went out to the pub with passing adventurers. I was able to meet hundreds of new friends. Jacobson was small but exciting. A year after I arrived they brought train tracks through our town. The train worked fabulously for shipping mail and logs back to St. Paul. The Swan River Logging Company and Mississippi Landing were doing great. My favorite memory came during one of our annual Fourth of July celebrations. On Independence Day every year, it was tradition to gather the entire town along the river and shoot fireworks. Well, before one of these celebrations a reporter from the Minneapolis Star stopped by. This reporter was beautiful. I remember she wore a yellow sundress and black flip flops. Her brown hair was pulled back in a tight pony tail. Her skin was perfect. Her eyes were stunning. Her body was incredible. This gorgeous reporter just finished covering a double homicide in the nearby town of Hill City. She was on the ferry back to Minneapolis, when her steam ferry broke down. All of the passengers on the boat were stuck in Jacobson for the night. Paul saw that I was smitten by the young lady. So he approached her, introduced himself, and recommended that she write a feature story on the successful town of Mississippi Landing. She liked the idea. After a brief interview, Paul suggested that I give the reporter a tour of the town. I was giddy. I showed her our sawmill, introduced her to a few drunks, and took her for a ride down the Mississippi in my canoe. She had never been in a canoe before. At night we sat on the river bank with a crowd of over 400 people and watched the poorest display of fireworks I have ever seen. She thought it was funny. I was embarrassed. Three days later the steam ferry was repaired and chugged back to the cities. My reporter friend stayed behind. In September we got married. My wife continued to cover events that took place in northern Minnesota for the Minneapolis Star. I still loved my job as Postmaster. A year after we were married my wife had twins. That was the happiest event of my life. A week after their birth the Swan River Logging Company’s contract with some big shots in Minneapolis ran out. Soon the company went out of business. Without the logging company not around, the train stopped running through Mississippi Landing. The steam ferries were no longer needed when a bridge was built over the river and roads spread throughout the north. The last of the ferries was sunk in 1928. Rumor was that it was sunk on purpose for the insurance money. My uncle died in 1937. Soon automobiles just drove on by Mississippi Landing without a second thought. A few residents used my post office, but not too many. After Paul Jacobson died I changed the name of the office from Mississippi Landing Post Office to Jacobson’s Post Office. I felt I needed to honor my old friend. Years later, some fellow who made maps was traveling down Highway 65 when he saw my sign, JACOBSON’S POST OFFICE. This fellow was probably confused and thought the name of the town was Jacobson. Today there is a tiny speck on the any Minnesota map called Jacobson, Minnesota. It is near Big and Little Ball Bluff. Stop by if you ever get the chance. Today there is a recreation hall, a baseball field, a small convenience store called Mississippi Landing, and a post office. I heard that after all these years the post office was being closed down. It is supposed to be demolished next week. Before it completely disappeared, I asked my grandson to drive up north and take a photograph of it for me. He brought it to me during my birthday party. I cried. I looked at the picture for a long time. After some thought, I told my grandson to keep the picture. I told him what that picture meant to me. I told him about the ferries and sawmills that have long been erased from the nations consciousness. I told him that when go off with my wife, Paul, and Uncle Nick, to listen to the picture.